A flawless recreation of one of the best de-essers ever made, VLB 902 gets the job done with no mess or fuss. Simple. Effective. Incredibly authentic. Detector signal monitoring. De-ess signal monitoring. Lack of surgical features won't satisfy the perfectionist. Back in the halcyon decade of the recording studio - the 1980s - there was one dominant option when it came to de-essing: the DBX 902, a 500-series 'lunchbox' module commonly racked up in groups of four or five. The DBX '90' range also included the 903 compressor, 904 gate and 905 EQ, but none of these were as popular as the 902 de-esser. There were two main reasons for this: the 902's simplicity, and its effectiveness. LSR Audio's plugin emulation of this classic, VLB 902 (AU/VST/RTAS/AAX), comes in a window that takes up two 500-series 'slots'. A faithful replication of the original hardware occupies the left half, while a set of all-new listening modes takes up the right. The controls don't take long to get your head around. The In switch at the top activates the unit, while the HF Only switch below toggles between full-band reduction and just high- frequency reduction when esses are detected. Next to these is the ten-stage LED-style Gain Reduction meter - a fast-acting display that clearly shows how many decibels your esses are being reduced by. 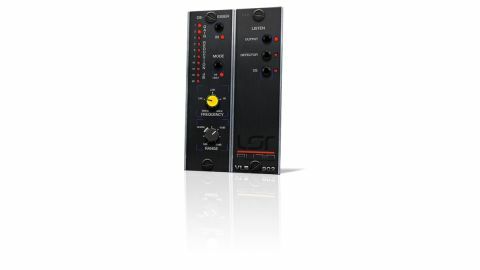 The 902 uses a VCA to control the 'ess' level, with the Frequency knob setting the target frequency above which sibilance is detected, and the Range knob controlling the amount of sibilance reduction required. In the right-hand panel, you can switch between listening to the main de-essed signal output, the Detector signal and the isolated DS signal. Simply use the Detector monitor while moving the Frequency knob to identify the problem band, then switch over to the DS signal while twiddling the Range knob to hear what's being rejected. We're quite familiar with the hardware version, and it was a joy to fire VLB 902 up and get impressively similar results equally quickly and easily, targeting and dispatching vocal sibilance in a very subtle, transparent way. Yes, you can get your singer to lisp by turning the Range up too much, but if you keep it within the recommended 'Norm' quadrant, you're pretty much guaranteed excellent results in an instant. It also works well on non-vocal signals in which high frequencies are an issue. All in all, VLB 902 is a very faithful reproduction of the original DBX 902, both inside and out. If you're familiar with the original, you'll immediately feel at home and quite possibly a tad nostalgic as you hear those esses melt away with minimal effort on your part, the added monitoring features making setup even easier, if that's possible. It might lack many of the features you expect on a modern de-esser plugin, such as attack and release times, Q, lookahead and mid/side processing, but sometimes you need something that 'just works', and in that regard, VLB 902 is more or less perfect.